JUSTIN Bieber won't be posing with his Scots fans when he comes here later in the year. 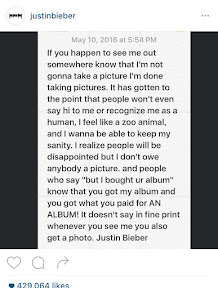 The singer, who already cancelled his meet and greet packages on tour, has had enough of having his picture taken with fans and doesn't want to be treated like an animal in a zoo anymore. 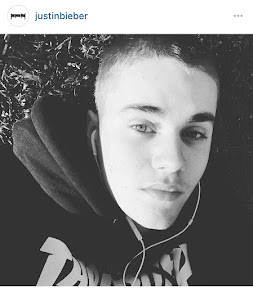 He posted a message to his Instagram on saying he is 'done taking pictures' . On the upsetting post Justin who performs at the SSE Hydro in Glasgow on October 27, 29 and 30 wrote: "It has gotten to the point that people won't even recognize me as a human, I feel like a zoo animal, and I wanna be able to keep my sanity. I realize people will be disappointed but I don't owe anybody a picture. and people who say "but I bought ur album" know that you got my album and you got what you paid for AN ALBUM! It doesn't say in fine print whenever you see me you also get a photo."